Under pressure from investors and new board members, NRG Energy is preparing to sell off its renewable power plants as part of a wide-ranging restructuring plan. NRG, a top competitive energy supplier with more than 45 gigawatts of conventional and renewable power assets in the U.S., has been working on the restructuring plan since February. It revealed details Wednesday morning. The power provider is looking to sell up to $4 billion in assets across its coal, gas, solar and wind portfolio. That includes 6 gigawatts of conventional power plants and, potentially, more than 3 gigawatts of renewable energy plants. NRG will also shed 15 gigawatts of coal and gas plants after it spins off GenOn, the bankrupt generator it acquired in 2012. Details about specific projects were not announced. NRG plans to divest its entire stake in its YieldCo, NRG Yield, and sell off 50 to 100 percent of other operating renewable assets. The sale of renewable assets could include power plants in operation or in development, said NRG CEO Mauricio Gutierrez. "We're looking at the entire package. You should think about the development company, the operating company, and the yield as an integral part of the proposition that we have in the market," he said, after unveiling the plan to investors this morning. The divestment process is already "well underway," said Gutierrez. Citi, Goldman Sachs and Morgan Stanley are advising the sales, which are expected to be completed by the end of the year. The portfolio review is part of NRG's three-year "transformation plan" developed by a special committee. It includes over $640 million in long-term cost-cutting measures, including streamlining power plant maintenance and design, cutting head count, and outsourcing back-office services. 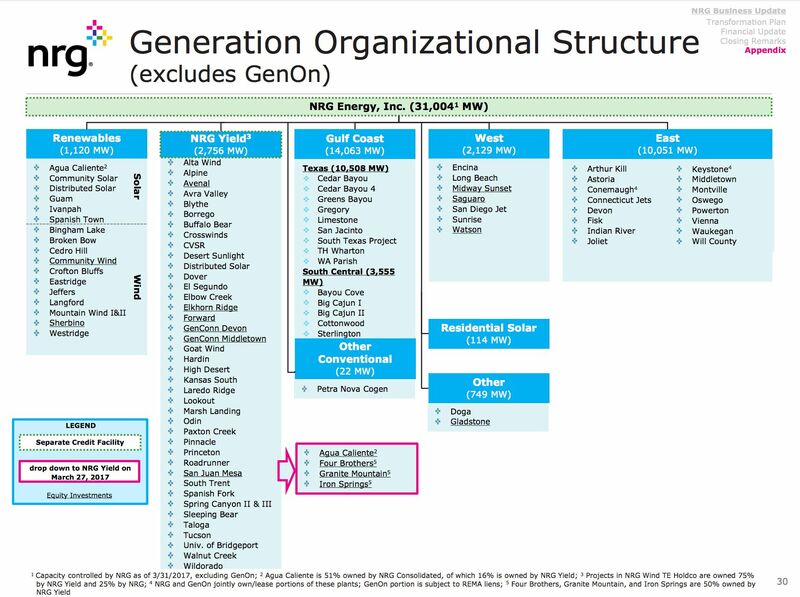 NRG's $215 million "margin enhancement plan" includes scaling up the retail business, focusing on commercial customers, and optimizing dispatch of power plants, among many other measures. Gutierrez said the plan will make NRG the "lowest-cost generator on the market," beating the average all-in wholesale cost of peers by $10 per kilowatt. In total, the restructuring is intended to free up more than $6 billion in cash through 2020: "50 percent more cash with 70 percent less debt and 50 percent less cost," said Gutierrez. NRG is not walking away from renewables entirely, said Gutierrez. Rather, the company will revisit new generation investments -- conventional and renewable -- after the plan is executed at the end of 2019. "We will look to invest in projects with a 12-15 percent [return]," he said. NRG has transformed itself multiple times in the last three years. Under former CEO David Crane, the company expanded aggressively into residential solar, energy efficiency and electric-vehicle charging. Crane was ousted after investors soured on his vision, and those businesses were wound down. Most recently, NRG shed its struggling residential solar division. After Crane's departure, Gutierrez oversaw the acquisition of a large portfolio of renewable power plants, including 1,500 megawatts of SunEdison's solar projects. The company has initiated new community solar projects in recent months as well. But investors and board members are hungry for more cash -- and they want those projects to be sold off quickly too. 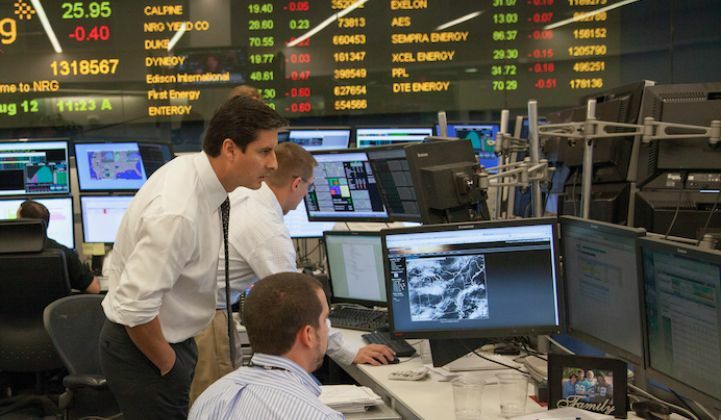 So nearly everything in the company's renewable energy portfolio could be put on the market. Gutierrez described his new mandate: "Manage this business for cash."